Nebs. That’s what the Indie kids called us. After Knebworth Park and the Knebworth Festival. Yes, even though heavy metal wasn’t really associated with Knebworth. I guess logic rarely penetrates the mind of a fifteen year old. Metal was the first scene I got into. It was the early 90s and British Heavy Metal was going through a resurgence. Kerrang Magazine were calling it the Second New Wave of British Heavy Metal, with bands like The Almighty, The Wildhearts and Thunder coming to prominence. Iron Maiden went to number one with ‘Bring Your Daughter… to the Slaughter’, and their future singer, Blaze Bailey, first inspired me to want to be a writer through his rants in the fanzine of my then favourite band, Wolfsbane. I had the leather jacket. I had the drainpipe jeans and studded belt. I made the pilgrimage to the Monsters of Rock festival at Castle Donnington that all good Nebs were required to make (the Indie kids should have called us Dons!). Friendships were formed based on the bands that we listened to and many of those friendships have endured to this day. And even after I’d discarded the long hair and denim waistcoat cluttered with band patches, metal still held the power to energise me. By 1996, my tastes had widened and I was listening to Supergrass and Chumbawamba. Yet when my dad died a month before exams, it was the music of Metallica, Dub War and Rage Against That Machine that drowned out the world and lent me the strength to focus on revision. Fast forward a decade. Up in Sunderland to visit my brother (a dedicated metalhead). He gives me a copy of Bruce Dickinson’s 1998 album, ‘The Chemical Wedding’. Bruce had spent most of his career as lead singer for Iron Maiden, before quitting the band in 1993 (and rejoining in 1999). He had released a series of solo albums, all different styles, from trad. rock to grunge, but all with something to recommend them. I hadn’t heard his last couple of offerings, but Rich sent me home with a copy and a wink that said, ‘trust me’. I arrived back and loaded the disc into the five CD changer that I used to use when reading. Nina Simone, Jeff Buckley, 'The Basement Tapes', Miles Davis and the like came and went from the mix, but ‘The Chemical Wedding’ remained. Over the days and weeks, I came to see it as the epitome of everything that had attracted me to metal in the first place. I like music that is about something. We all have trash hiding away in our collections, and I am no exception. Yet while my tastes have diversified over the years to take in most anything from Shostakovich to Slayer, I’ve never been able to tolerate mainstream, manufactured pop. That’s because it’s about nothing. Words plucked out of the air, arranged into some semblance of order and wailed over a tinny drum machine. Add a full orchestra if you like, it’s still of no value. And yes, I know pop music is for dancing to. Sorry, I don’t dance (not in front of other people at least). Good music is be listened to and appreciated on a constant loop, until every lyric, note and cadence is memorised. And then you write a two thousand word article about what you’ve heard (sarcasm). ‘The Chemical Wedding’ is about something. It’s about a lot of things. Dickinson initially set out to make an album about alchemy and transformation, but found that after the first few songs he had blown himself out. And then he turned to the poetry of William Blake. The album takes its title from ‘The Chymical Wedding’, a seventeenth century alchemical text, but it is Blake that lies at its core. I used the planned writing of this article as an excuse to go and read Blake’s works in their entirety. I had read a lot of Blake in my youth, most of it from earlier works like ‘Songs of Innocence and Experience’ and ‘The Marriage of Heaven and Hell’. Yet it his longer, prophetic works that inform much of The Chemical Wedding: Songs with titles like ‘The Book of Thel’ and ‘The Gates of Urizen’, as well as spoken passages from ‘Milton’ as voiced by Arthur Brown (of The Crazy World of Arthur Brown fame). I must say that when I first set out to read ‘The Book of Thel’ and ‘The First Book of Urizen’, I was confused. They seemed to bear no relation to the songs that bore their names. 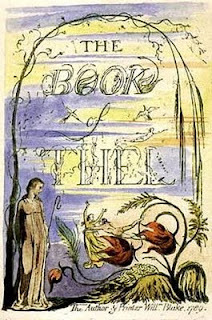 Blake’s Book of Thel is about a young girl drifting around a garden (possibly the Garden of Eden) and conversing with anthropomorphised forms of nature; the lily, the worm, the cloud. Dickinson’s Book of Thel is about human sacrifice. Was I missing something? the scales fell from my eyes. 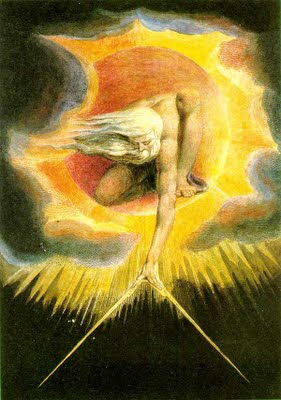 Blake’s prophetic works are reimaginings of contemporary events and biblical tropes. ‘America: A Prophecy’ and ‘Europe: A Prophecy’ retell the recent American and French Revolutions, with their generals and kings transposed by Blake’s own mythical forms, Orc, Albion, Enitharmon: Giants of antiquity that sleep for millennia and do battle from across oceans. 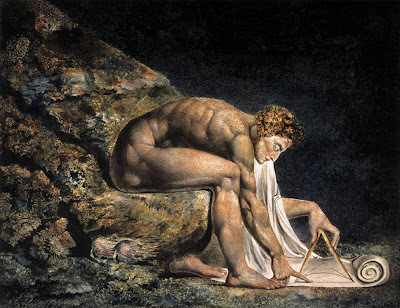 In ‘The First Book of Urizen’, ‘The Book of Ahania’, ‘The Song of Los’, through to Blake’s last epic poems, Creation itself is replayed, bearing little relation to the original biblical texts. Blake was constantly defining and redefining his own mythology, drifting further and further from the sense of his initial prophecies. Urizen as found in ‘Milton’ bears little relation to the ‘self-closed, all repelling’ shadowy figure of The First Book. Taking all this into consideration, it is of course appropriate for Dickinson to have borrowed Blake’s spectacles, appropriating the names of Thel and Urizen and remoulding them in his own image in exactly the same way as Blake had done. Bruce’s own Book of Thel even contains lines borrowed from ‘Macbeth’ (‘By the pricking of my thumbs, Something wicked this way comes.’). But then, if any artist plundered the past for ore with which to shape his plays, it was Shakespeare. Yet even as Bruce borrows from Blake, so he returns the favour in kind in that eternal cycle of renewal and rebirth. On ‘Jerusalem’, Dickinson takes the words of Blake’s most famous work and expands upon them. Blake provides the verses: Bruce adds chorus and refrain. Blake: And did those feet in ancient time, Walk upon England's mountains green? Blake: And was the holy Lamb of God, On England’s pleasant pastures seen? Me: No. No he wasn’t. And yet once you start reading Blake (and around Blake), a number of things become readily apparent. For a start, the poem isn’t called ‘Jerusalem’. The words commonly known as ‘Jerusalem’ actually form part of a short preface to the longer poem, ‘Milton’. This preface is written in part prose, part verse, a classical form to be found in the works of Seneca, Dante’s ‘Vita Nuova’, and even ‘The Chymical Wedding’. Secondly, Blake had a habit of writing and printing prefaces to his illuminated works, that he would then discard at a later date. ‘Milton’ is no exception. Only two extant copies exist of this preface and it is therefore ironic that perhaps Blake’s most famous lines were regarded so cheaply by the artist himself. It is also ironic that ‘Jerusalem’ is such a popular hymn in the Anglican church, given that Blake was a member of dissenting religious sect which despised the priesthood and its substitution of virtue for pomp and privilege. Moreover, Blake was a republican (as were many of his contemporary poets), with ‘America’ and ‘Europe’ depicting the rebel angels as heroic in the face of the tyrant Albion. Think about that the next time you see a member of the aristocracy singing about not ceasing from Mental Fight, and allow yourself a smile. Also, once you start reading the actual ‘Jerusalem’ (‘Jerusalem, Emanation of the Giant Albion’, Blake’s longest completed work), you realise that Blake isn’t talking about Jerusalem as an actual place existing in time and space. Blake experienced visions (suffered, some might say) throughout his entire life and claimed to regularly converse with angels. His poetry and artwork are the manifestations of these visions. Jerusalem is not England, it is not even London. It is wherever Blake walked, hence why the centre of the universe in his final epic is South Molton Street, the address where he spent many of his remaining years. The issues that I had with the poem commonly known as ‘Jerusalem’ meant that for years it was the one track on ‘The Chemical Wedding’ that I used to skip. Knowledge brings tolerance and with a greater understanding of it lyrics, ‘Jerusalem’ regains its visionary charm (it is certainly less offensive than some of the passages in the actual ‘Jerusalem’, like where Blake addresses the Jews: ‘Take up the cross, O Israel, and follow Jesus’). Dickinson’s version reinvigorates the sterility of the hymn and gives it back its energy. Not only do I leave ‘Jerusalem’ playing these days, I’ll even find myself singing along. There’s progress. I suspect that Blake would have been appalled by some of the other themes on ‘The Chemical Wedding’. In ‘Trumpets of Jericho’ for instance, the trumpets sound, but ‘still the walls remain’. Although in true Blakean style, the lyrics have little else to do with the Joshua of the Old Testament (and archaeology informs us that Jericho had no walls). The song also references the opening lines of Jean-Jacque Rousseau’s ‘The Social Contract’: ‘Man is born forever free, but is everywhere in chains’. I wonder if Bruce realises that despite being the father of the French Revolution, Blake came to condemn Rousseau along with Voltaire and Newton for their trust in reason above belief (“Mock on, mock on, Voltaire, Rousseau: Mock on, mock on: ‘tis all in vain! You throw the sand against the wind, And the wind blows it back again”). However, it takes more than a decent set of lyrics to make a great album. 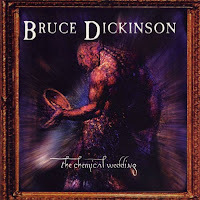 What makes ‘The Chemical Wedding’ the epitome of heavy metal isn’t just its morality plays or its references to Satan; it’s the apocalyptic openings of its songs, the duelling guitar solos, the contrasts in Dickinson’s voice between the melodic and the air-raid siren. It has the same grinding rhythms of any metal album. The same bass runs and drum fills. It can also be accused of being as clichéd as any metal album. And yes, there are clichés here too, but you know what? There’s nothing wrong with a good cliché. I’m not claiming ‘The Chemical Wedding’ as the greatest album ever made. If I want to listen to musical perfection, I also have Johan Sebastian Bach in my collection and he pisses all over every other composer in recorded time. Yet if you want to know what heavy metal music is about, with all of its energy, exuberance and excess, you could do much worse than to start with ‘The Chemical Wedding’. ‘The Chemical Wedding’ may not be the greatest album ever recorded, but in the same way that Alice in Chains’ album, ‘Dirt’, defines everything that the word ‘grunge’ conjures up for me, so ‘The Chemical Wedding’ represents everything that I hear when I think of heavy metal (right down to the Spinal Tap-esque mandolins on ‘Jerusalem’). It is metal’s epitome and its apotheosis. What elevates mere entertainment to the level of art is its ability to open the doors of perception to new experiences. If you haven’t read Blake before, Bruce offers you a way inside the troubled mind of genius. Blake wasn’t perfect, but he was brilliant. As with Blake, so ‘The Chemical Wedding’. Saw your comment linking to this on your Last.Fm profile. I'm starting to read Blake's work, any suggestions? Please, forgive the poor english, I'm brazilian, so Im not very used to writing in it. Your English is excellent. Better than my Portuguese.